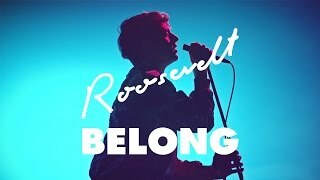 Towards the end of 2012, a 22-year-old Marius Lauber, working under the moniker Roosevelt, quietly released his debut single, Sea. A pulsating, hypnotising slither of sun-kissed disco with its own self-made video, it steadily tiptoed across the blog world, eventually reaching the ears of hugely respected electronic pop label Greco-Roman (co-run by Hot Chip's Joe Goddard), who would go on to sign him and subsequently release his debut EP, Elliot. Sea was the first example of the happenstance that's dotted his career so far, helping him move from playing in guitar bands as a teenager to being one of the most exciting prospects dance music has to offer, as showcased by his forthcoming self-titled debut album (released by Greco-Roman/City Slang). With coverage from the likes of Pitchfork and Thump, over 5 million Spotify streams and 1 Million YouTube plays, support tours with Hot Chip and Totally Enormous Extinct Dinosaurs and a litany of high-profile festival slots around the world, Lauber has steadily built up a dedicated following drawn to the forward movement of his expansive, dreamy productions. Written, recorded and produced solely by Lauber over a period of two years, and mixed by Chris Coady (Future Islands / Beach House), ”Roosevelt”, the album, is a pillow-soft hallucinatory dreamscape taking in acid funk, nocturnal reveries and a lilting sense of melancholia. Playing drums in mainly guitar-heavy school bands in his teenage years, a move to Cologne by himself at the age of 19 permanently shifted his relationship with dance music as he was slowly educated by its hypnotic and steady repetition. His immersion into that world was so complete that he soon became resident DJ at Kompakt’s Total Confusion party with Superpitcher & Michael Mayer. It helped Lauber realise how dance music connects to its audience in a different way to what he'd experienced in his various bands. “What I really enjoyed about DJ-ing was that you could see the results immediately,” he explains. “Before it was about playing in a cool band and people would come and see it but often there would be no feedback or interaction really between people. That's why I instantly connected to dance music.” That's not to say that he's completely ditched his guitar past, as all of Roosevelt's songs – from the percussive shuffle of Moving On to the soft shimmer of Close to the undulating disco of Night Moves - feature layers and layers of delicately constructed guitar playing that weaves in and out of metronomic beats and expanding synths. “I'm not consciously trying to meld those two worlds, it's all a really natural process.” Lauber says. Although the debut album feels indebted to 4/4 dance music, listeners will hear a progression towards sophisticated, classic song structures. Even the darkness hinted at in the title of ’Night Moves’ is more about the energy you can get from peaking in a club at just the right time. “It's about the situation at night in a club when the energy is created as the night comes to an end,” he says. “The later the night gets there's this peak of energy and people are having the illusion that there's no end to it and that power is incredibly strong.” The album is also underpinned by a sense of movement and forward motion, not just in the way the melodies unfurl and expand, but also in the way the impressionistic lyrics are constructed. So while Moving On makes this idea explicit (“You’re Moving On / It’s alright to see this on my own / Just let me go / I got out of here to reach for more”), it's also there in the delicious swirl of Fever as he sings, “Fading back into the night / No nothings gonna hold us down / Leaving all the rest behind.” A circular musical journey and the shifting of time are also embedded in the fabric of the album's influences, specifically in the way it feels international – a pinch of French dance-pop here, a smattering of LA yacht rock there – but also underpinned by German electronica pioneers like Manuel Göttsching, Ash Ra Tempel and Neu!